The game of the week in South America last week was the first leg of the Sao Paulo State Championship between Sao Paulo and Santos. The first 4 months of the year in Brazil are devoted to the more than 20 different State Championships. The poor quality of play in most of these State leagues would surprise football fans brought up on the myths of Brazilian brilliance. The standard of play generally is no better than can be found in the lower Scottish divisions, with many of the bigger clubs not taking them seriously in favour of concentrating on the Copa Libertadores and Copa Brazil tournaments. The biggest best and most organised of these State leagues is the Sao Paulo State Championship but even this League does not have quality strength in depth. Readers of the GGW “The Fat Boy Done Good” post of June 2009 will remember that Corinthians won the 2009 version due mainly to the goals of Ronaldo. This time, Corinthians, the best supported club in Sao Paulo, did not bother to make a serious attempt to retain their State crown, preferring instead to concentrate on their Group games in the Copa Libertadores, the South American equivalent of the European Champions League. Corinthians have never won the Libertadores and are desperate to do so in 2010 their Centenary year. Palmeiras, another of the Sao Paulo Gang of Four, and the only top Brazilian club to play in green and white, did try to win the State League. However still demoralised by the shocking collapse in December that cost them the 2009 Brazilian Championship, they stuttered through mediocre form and failed to qualify for the 4 semi-final places. It was left to Sao Paulo and Santos to uphold the honour of the traditional Big Four. Santos finished top of the initial League stage which they dominated with brilliant attacking football to gain second leg home advantage against the 4th place team, Sao Paulo. The other semi-final was due to take place at the same between 2nd placed Gremio SP (not to b e confused with the more famous Gremio Porto Alegre from Rio Grande State) and 3rd placed Santo Andre a club relegated from the Brazilian Championship in 2009. Sao Paulo and Santos are not just two of the biggest clubs in Sao Paulo, or even Brazil but in the whole world. Both of them have been World Club champions on more than one occasion. Santos reigned supreme in the early 1960’s under the influence of the world’s best ever player Pele. In 1962 they won the Copa Libertadores then beat Benfica to establish themselves as the best team in the world. They retained the Libertadores in 1963 and went on to beat AC Milan for the World crown. As well as Pele, that team of the early 1960s had world class players like Carlos Alberto Torres( the full back who scored that unforgettable 4th goal in the 1970 World Cup Final) Gilmar, Zito, Mauro, Countinho, Pepe and Edu. The club, from the busy port of Santos 50 miles down the coast from Sao Paulo city, went into a long downward spiral after Pele moved on but revived in the new Century. They won the 2002 and 2004 Brazilian championships and in between reached the final of the Libertadores in 2003 only to lose to a strong Boca Juniors. That team had young stars like Robinho, Diego, Elano and Renato who all have gone on to star in the top leagues of Europe. Santos won the Sao Paulo State League in 2006 and 2007 but in the last few years have failed to perform well in the Brazilian League, falling well below the Libertadores spots in 2009. Sao Paulo have 3 times been Copa Libertadores champions, each time going on to win the World Club Cup. In 1992 and 1993 under clever coach Tele Santana they established themselves as the best team in the world beating Barcelona in the 1992 Final and AC Milan in the 1993 game. In 2005 they won the first World Club Cup involving the 6 Confederation Champions beating Liverpool in the Final. Sao Paulo have been the best organised and most successful Brazilian club of the past few years. In 2006, 2007 and 2008 they won three successive Brazilian Championships but failed in each subsequent attempt at the Copa Libertadores despite being among the strong favourites every year. Last year, when Palmeiras collapsed just before the finishing line of the Brazilian Championship after looking certain winners for months it looked as if Sao Paulo would collect a 4th consecutive title until their own astonishing stutter in the final few days allowed a slightly bemused Flamengo to take the title. However the sensible Sao Paulo Directors kept faith with coach Ricardo Gomes, who has extensive managerial experience in France most recently with Bordeaux and Monaco. They also invested in bringing three players back from Europe. Two former Sao Paulo heroes attacking full back Cicinho, back from Roma and Alex Silva a classy defender rescued from a poor experience in Hamburg,. and an old Santos favourite Cleber Santana a skilful midfielder who never quite settled at Atletico Madrid. They joined existing stars like World Cup winning goalkeeper Rogerio Ceni, who has scored, yes scored, over 80 goals mostly from penalties and freekicks, commanding centre back Miranda and constructive midfield star Hernanes. These latter two will almost certainly move to European clubs in the summer. They would be brilliant assets for Celtic but alas not under current economic circumstances. The main story of the year in Brazil though has been the sensational repatriation of Robinho back to his old club Santos. It is still unclear how they have managed to find the money to pay Robinho’s inflated Manchester City wages (or indeed even if they have, but that is another story, which may emerge later). Whatever the financial arrangements involved, there is no doubt the move back to his old club Santos has transformed Robinho rapidly from an unhappy, grouchy and ineffective player, back into the world superstar that convinced both Chelsea and Manchester City to offer more than £40million for him. Playing with a smile on his face he has led Santos to a series of victories with exciting attacking football producing many goals. He has been assisted in these endeavours by Santos’s trio of outstanding young talents Neymar, Paulo Henrique Ganso and Andre. If you have never heard their names before make a note of them because they are likely to be the new Robinhos and Diegos of the next few years (if not the new Peles, as every young Santos player gets cripplingly labelled). Neymar is only 18 years old but has been tipped for several years as a future superstar and there is a campaign under way aided by Pele and Zico to persuade National coach Dunga to take him to the World Cup, as Brazil did with a young Pele in 1958 and a young Ronaldo in 1994. Santos coach Dorival Junior has encouraged a positive approach fielding five attacking players most games with Robinho and Andre up front supported by Neymar, Paulo Henrique Ganso and Marquinhos, and only one defensive midfielder, Arouca bought in on loan from Sao Paulo. The defence has an excellent goalkeeper Fabio Coosta and two players with extensive European experience in Edu Dracena and Leo. So the first leg of what everyone in Sao Paulo has assumed is the true final, took place on Sunday in Sao Paulo’s stadium, the Morumbi. Santos stayed true to Dorival’s attacking principles with the gang of five all selected. He was rewarded by a sparkling first half performance which saw Santos score two goals and Sao Paulo have a player sent off. However Ricardo Gomes drew on all his experience at half time, brought on Cicinho as an attacking full-back, and pushed Jean up to reinforce the midfield, sacrificing a forward but not attacking determination. His reorganised team took the game to a stunned Santos in the second half. Within 20 minutes of the second half the revived 10 men had brought the game back to 2-2 parity and encouraged by the partisan Morumbi crowd, pressed on for outright victory. 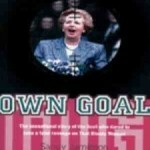 However the miracle never quite happened and in the last minute of the game Santos centre back Durval thundered home a dramatic header to clinch a 3-2 away victory. 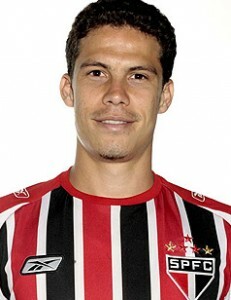 The GGW man of the match was Hernanes, magnificent in defense, superb going forward, he scored a great goal and generally controlled the game. He showed more commitment, determination, aggression and skill than the whole Celtic team had against Ross County. He probably added another £5m to the £20m needed to buy him. But on this kind of display Real Madrid and AC Milan his most ardent suitors will do well to find the money for him. After the game both managers acknowledged that the tie was not yet settled. However with the away goal rule in force in next Sunday’s second leg at the Vila Belmiro stadium, the odds must favour the home side Santos. Robinho who had a good game rattling the crossbar and playing positively without scoring, expressed the view after the game that Santos should remain true to their attacking style in the second leg rather than playing defensively to hold their advantage. He admitted Santos has relaxed too soon in the Morumbi but remained upbeat about the chances of securing his first Sao Paulo State League title. Santos proved on Wednesday their morale had not been damaged by the second half slump, when on the day of the club’s 98th birthday they thumped state neighbours Guarani 8-1 in the first leg of their Copa Brazil tie., with Nilmar scoring 5 and Robinho 2 of the goals. The current Santos team are a unique team in the world top class game, with 3 fast skilful attackers, 2 attacking midfielders and a right back who is really a winger. In 2010 they have scored an amazing 88 goals in only 25 games(that this is nowhere near a Santos record is due to the young Pele who 3 times helped Santos exceeded this average). There is a breath-taking excitement about their game, a sparkling naivety. However there is the nagging thought that they can play like this and succeed against the poor quality of the Sao Paulo State league but one wonders what the top European coaches like Benitez, Mourinho, Ancelotti and Wenger would do with the spaces they leave. It only took wily Ricardo Gomes 45 minutes to suss them out and reverse things. Still all power to them for their bravery and flair and let us hope they succeed at least at State level to prove that attacking football can succeed.